So you guys have explored the Horn. Since you guys found all of the secret doors and trap doors, I thought I would post up the maps. I asked Russell about printing them up on the plotter. That way you guys can mark directly on a map what changes and reinforcements you guys want to put in place. There is also a key that I will give you guys on Tuesday. 23 total Valek’s men VM- 12 on guard duty, 12 on mission with captain. The Lower Caverns- Carnetheria Rex roaming free. 5 skeletons on roving patrol- except for mudmen room. 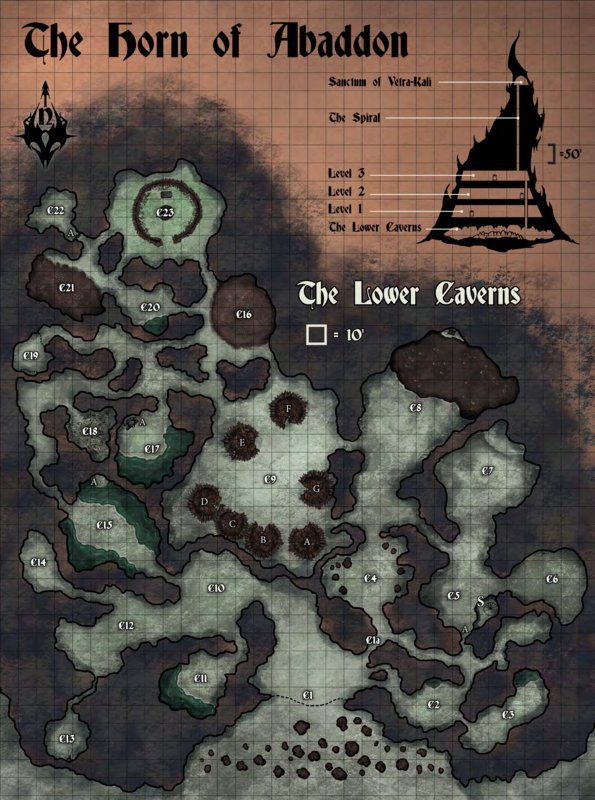 C1- Entry point- area up to dotted line is difficult terrain- swampy, lots of rocky debris- heads of 2 moon dogs on spikes, with explosive runes triggered by spells cast upon it. Wooden planked walkway on paper map. 2 assassin vines on the left (facing). Entry point choked down at the dotted line on map to a 10’ wide opening by Walls of Stone. C5- Crossroads cavern, secret door (DC 30) to spiral stairs here. Stairs 5ft wide. Level 1- 2 minions roving per shift, 5 skeletons on roving patrol. 1-9+10- “Death’s Head Tavern”- fireplace, bars, and grill. Half rebuilt. 2-1 “The Right Eye”- 5’ wide stairs, 200’ high to access, pit trap dumps into 1-23, pivoting floor piece missing, arrow slits on both sides of hall, 4’ half wall at turn- Assassin vine outside (fried by Treya) Entryway blocked by Wall of Stone. 3-5 Fane of the Three Eyed Prince- if statue of Vetra-Kali is approached without saying “Hail Vetra-Kali,” Wis DC 18 or under Fear spell- Ezra and his wraiths split their time between this room, and 3-9 (the meditation room). There are 12 wraiths. 3-6 Treasure room- secret door DC 30- pocket dimension accessed by saying “Hail Vetra-Kali” as passing through doorway, otherwise empty room. Havalyns sword and the Justicar are stored here. 3-9 Meditation hall- Nen teleport circle- Cinnamon the golem is stationed here. 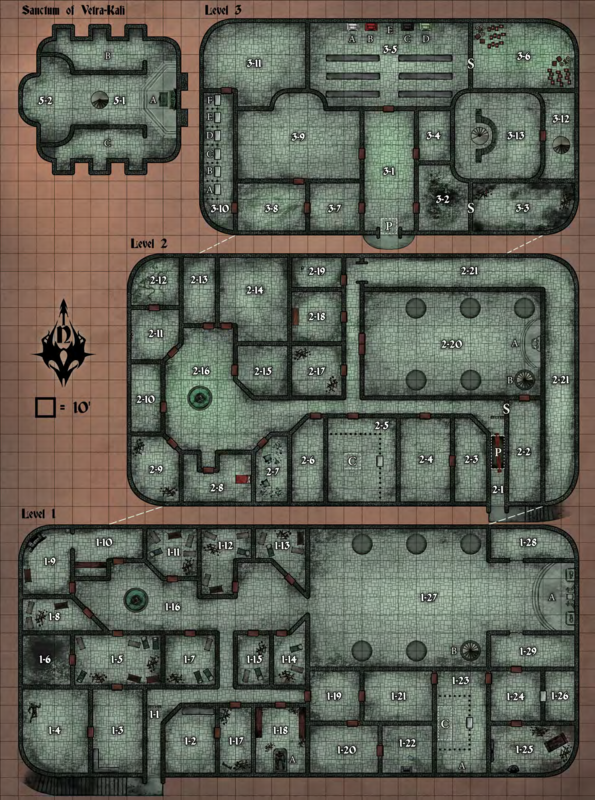 3-13- Vaulted chamber, Hexor and Vexor usually hang here, curved 4’ half wall, bottom of spiral stairs to Sanctum. Stairs are 5’ wide. Opening to 3-3 in south wall. Here are the powers of the Eyes of Vetra-Kali now that they are all activated and socketed in the Sanctum statue. The Eye of Vigilance- Functions as a Crystal Ball with True Seeing limited to the confines of the Horn. In order to use it, you need to be standing in front of the statue in the Sanctum. The Withering Eye- Desecrates the Horn, undead and demonkind (fiend) gain +1 on all attacks and saves. Any undead or demonkind created or summoned in the Horn gain +2 HP/HD. Demonkind in the Horn gain Regeneration 10. The Eye of Hatred- Pulses when divine magic of Good origin is used within the Horn, and directs the Eye of Vigilance to show where it is being used. The Eyes also power the arcane shield that now envelops the Horn. The shield prevents teleportation and magical messages from passing through. Any saves against Scrying through the barrier are made at Advantage. All of these magics work just fine while in the Horn, just not through it. The area of the Sanctum, including the balcony, is further protected by an unholy barrier that damages creatures that attempt to cross it. Creatures that attempt to cross it must make a Wisdom save DC 15. Good creatures who fail the save take 4d8 psychic damage, and are poisoned for 1d4 rounds, Good Celestials take 8d8, and are poisoned for 1d8 rounds. Non-good creatures that cross the barrier take 2d8, and are poisoned for 1d4-1 rounds. A successful save halves the damage, and prevents the poisoned effect. A Dispel Magic will suppress the Sanctum barrier for 1d6 rounds, allowing safe passage for any being crossing it. This barrier only protects the Sanctum, and does not cross the Spiral Stair. Bump for adding changes and quarter assignments. Does this apply to the Nightmare and Hell Hounds now since they are Fiend ie Demonkind? Yes, they all gain the extra HP. The save and attack bonuses are onky while in the Horn, and they get those too. It sits in the ruins of a keep to the Northwest of the Horn. The throne is enclosed is a 30ft cube, with a 1 inch air hole on top. 4 Explosive Glyphs cast at 5th level- 1 by the air hole, 3 around throne.